When I told fellow artists that I was going to the Robert Rauschenberg exhibition at the MoMA I was met with replies such as “that exhibition was fantastic” or “you are going to love his work!” Though, as I walked through, it occured to me that while Rauschenberg and I might share the same notion to collaborate and support artists we respect, we do not at all see eye to eye as creators. Most of his work bored me to the point where I hurried through viewing the last two rooms so that I could leave and stumble upon something more inspiring. The exhibition essentially showcased all of his work throughout his lengthy career, as well as work from his artistic friends, which meant that there was almost too much art to consume at once. days at Black Mountain, an academic institution where the young artist studied in the late 1940s into the early 1950s. This particular piece is a symbol of Rauschenberg’s early days where he was first playing around with the arts; it seemed as though he played around with photography more in the beginning of his career rather than in the end. I would assume that he got carried away with bigger projects. This photograph is a black and white print that, while it plays heavily on light and shadow, still showcases the subjects visibly (which in this case is two wooden chairs sitting side by side in the corner of a room.) The framing of it plays on the parallel vertical lines of the chair with the vertical lining of the corner, which barely makes it in the frame but is there to create a three dimensional space within the photograph in order to draw you into the room/space at hand. The slanted shadow contrasts the straight vertical feel of the two chairs next to each other against the corner which gives it a pleasing geometric composition. 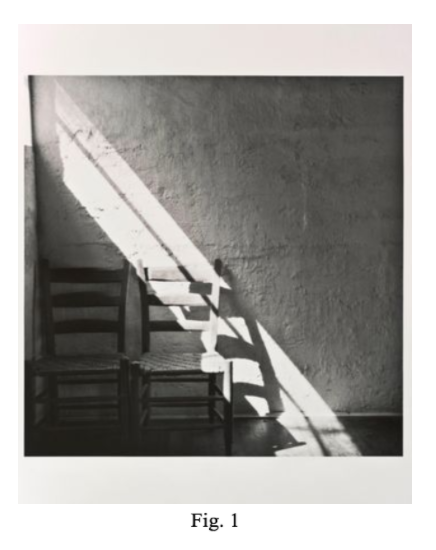 The horizontal lines within the chair match the floor line; thus a photograph that might simply look like two chairs under a shadow is actually a photograph that emphasizes the subtle, fun geometric instances one might document using light and shadow. The shadow of the chair to the right adds some complexity to the photograph however is not nearly as interesting as the geometry of the whole thing-I say this because I didn’t even notice it until I took a final glance at the photograph. It’s interesting to me that the shadow still visibly showcases what lies underneath the light and in the shadow. The chairs are clearly visible; a photograph playing with shadows normally keeps what’s in the shadows hidden in the shadows. This means that a dark contrast quality is missing in this photograph. The reason I chose this photograph is because it reminded me of two photographs I used in my college portfolio. Fig. 2 is titled “The Barren Wasteland That Is The Office” and Fig. 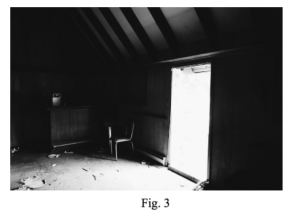 3 is titled “Abandoned House, Baldpate Mountain.” They are both digital photographs which were both taken in 2015. 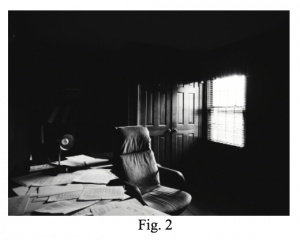 These photographs mark the first time I ever played with light and shadow in black and white, which means that this was around the time I first came to realize the importance of light in a photograph and how important its role is in black and white photography. shows signs of past human interactions but in the moment they were documented were nothing but empty spaces.